In a single string vibrates the ways to deal with art, which are disturbingly infinite, so as the wavelength of harmonics between two beings who are in love. It’s impossible to predict what is coming, more if science, design, technology, and music cohabit in order to make visible the behavior of the sound. Somehow, the task of harmonic series is to break the bonds of invisibility by giving disturbing answers as if it’d change the perceptive polarity; instead of not seeing –or just listening –a specter appears before the eyes of the observer and it mutates according to its vibration. However, the tool case goes further, when using the technical resource and at the same time follows a necessary process of search and learning. 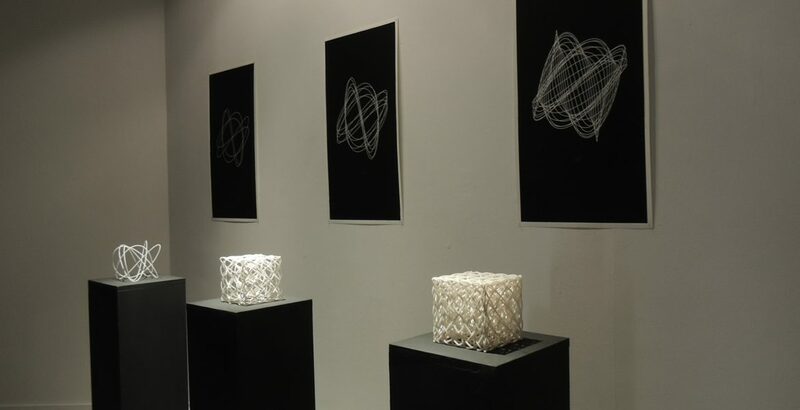 From the moment that the artists Manuela and Luisa were part of New York University’s interactive telecommunications program, they established a consistent work that deals with the implementation of software that reacts to sounds –this is developed in processing together with 2D and 3D printings. These are expressed by means of three wonderful sculptures made of photopolymer resin, where harmony is like an acoustic apparition that dilates, contracts, and expands, undulating even the space itself of the dual allocution. It’s a symptomatology where the analogous and digital meet up without supremacy, except for keeping a parallel dialogue. Without notice, a series of voices and helical shapes are unleashed. These reverberate, tremble, or stare the ones who look at them –unafraid people or maybe is upside down. No matter if the sonorous phenomenon is infinite; is fed by new and more accessible roads so each perception can be particular as an arpeggio, that harmoniously combined can give a range of sensations where curiosity plays an important role. The observer has room to think again how the vibrations of particles, when transforming into acoustic waves, end up in a curve that puts in evidence why this represents the final part of the exhibition. In other words, this is the fourth presentation of Anilla room (located in the Santiago Museum of Contemporary Art, Chile). It was also present in 2014 in the FILE festival (Brazil) and in the Bienal Kosice (Argentina). This opens a necessary passage between disciplines that are complemented to create not from the exuberance of monumentality, but from the simplicity of the echo and form. This is almost like a poem or a haiku, turning guttural breathing into a code that begins in the most basic part: the sound. This ends up with the astonishment of symbolism that has intervention with reality and fiction, –in a plastic and essential illusionism –just like when seeing art as an aesthetic analogy with the capacity to reinterpret the noise until obtaining the form, likewise an ovule and a sperm that join together to bring life. Trying a new arranging is hard because it puts you next to make mistakes; but that risk has a reward and here the result is demonstrated in a real way and far exceeded the expectations. 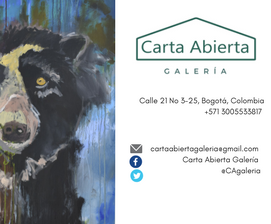 At the same time, there’s an important interaction with the artwork and the visitor who passes by between the consonant and dissonant. Nevertheless, it’s more about the visitor who is exposed to an atmosphere of sonorous and optical sensations that somehow provokes a shaking in your references. In that place is reasonable to ask yourself how your pain cries, moans of pleasure, and that last imperceptible sigh would be represented there. Maybe you can also wonder about the sound of an impertinent shot or the last wail of a mermaid that might be part of a futuristic harmonic series, which tell about dissimilar and disturbingly amazing moments of our lives.